According to Urban Dictionary, Catch-22 has become a more general term describing "a situation wherein both options are seen to have negative consequences." Whether we define it by its original context as a situation that cannot be solved due to inherently illogical rules or by the colloquial use above, in the context of relationships, we will all face Catch-22s. Spending ten weeks living and working in inner city New Orleans during one summer vacation from college gave me a taste of how much can be learned from immersing oneself in a completely different culture. In many ways I was completely separated from most of those things that I had previously believed formed my identity: I lived without clothing I liked, without music I liked, without food I liked, without the car I liked, and without the people I loved. I found myself stripped of everything I though was me, and yet I continued to breathe, to eat, and to love the people around me. If you've ever experienced anything like it you know how cleansing it is. 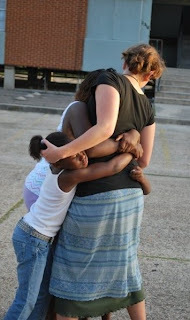 I yearn to experience this again, but to a greater extent. Thus, I have long wanted to join the Peace Corps. Then, I fell in love with Owen. We have so many plans. We want education and children. At first I held onto the idea that Owen and I would join the Peace Corps together after he graduates from his PhD program, but we don't want to have to put off having children for that long. Day by day my dream of joining the Peace Corps felt more unlikely. A few weeks ago the frustration of a Catch-22 like choice hit me. I felt that by being with Owen I would never get that immersion experience again. Yet, I have already determined that I do not care to pursue anything without him. By following him to Iowa I felt unhappy and unfulfilled, and yet I can't possibly be happy or fulfilled without him. The thing you never hear about Catch-22, but, which to me, seems most important is the moment when Yossarian finds his freedom from Catch-22. Orr, the crazy man described in the comment above, fakes his own death and leaves. 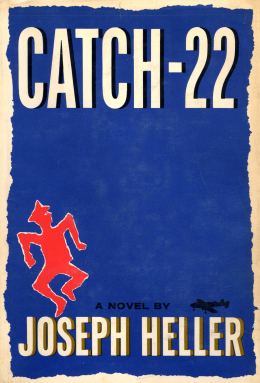 When Yossarian figures out what Orr has done, he realizes that Catch-22 isn't real. As I sat bawling my eyes out on the lawn of the Old Capital Building, Owen, much more versed in world traveling than I am, helped me to understand that there are other options for us besides the Peace Corps. Actually, there are many many options to work abroad, even with children. He reminded me that his very own family worked and lived abroad, experiencing other cultures during his childhood. There are never only two options. When we allow ourselves to get caught in Catch-22, it is only because our minds are limited.